Parry Sound, the largest natural harbour on Georgian Bay, was named by "Captain Henry Bayfield" after Sir William Edward Parry, the Arctic explorer. Bayfield surveyed the 30,000 islands in the early 19th Century. William Gibson built a sawmill at the mouth of the Seguin River in 1857. He sold the mill in 1865 to "William Beatty", who along with his sons William, Jr. and James, established the Town of Parry Sound. This photograph features William Beatty Jr. 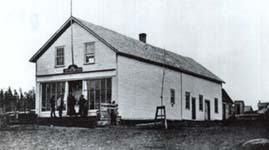 The Beatty's established a "general store", built the first (Methodist) Church and established a "steamship line" linking Parry Sound to Midland and Collingwood. The photograph on the right features Beatty's Corner in 1869. The photograph on the left features the Waubano, believed to be docked at the Collingwood port. The Ottawa, Arnprior and Parry Sound railway arrived in nearby "Depot Harbour" in 1897, and Parry Sound's first rail service, the Canadian Northern, arrived in 1906. 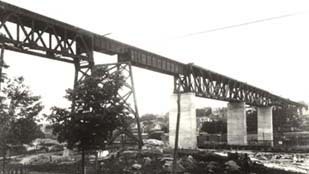 In 1907 the "Canadian Pacific Railway trestle" bridging the Seguin River was completed. At 1,950 feet, this is the longest trestle bridge in Ontario. This photograph, thanks to Canadian Pacific Corporate Archives, was taken in June 1908. "Railway Hotels" contributed to the tourism boom beginning at the turn of the century. This photograph features Rose Point Summer Resort. Former Boston Bruin defenceman "Bobby Orr", one of the greatest hockey players in history, is Parry Sound's most famous citizen. Many thanks to the West Parry Sound District Museum for their contribution of text & pictures for this section!